A section of my Southern trapline always produces a lot of cats. It’s located in a river bottom adjacent to a railroad track. A high ridge runs along one edge, and the railroad track is on the opposite side. To enter the property, I cross the tracks and unlock a gate. About 50 yards up the road, I park the truck at a “T” intersection, leaving two obvious ways to go on the four-wheeler. Another locked gate opens on to a mowed lane, and that takes me back to the river where a tumble-down cabin sits on the bank. The other choice is a logging road that leads through the timber and eventually back to oxbow lakes adjacent to the river. Proximity to the river makes beavers an ever-present problem here. That’s what got me in. The cats are just a bonus. Currently, Scott Brown manages the land for his family, and he is the second generation with whom I have worked. Scott sets trail cameras for deer, and he often captures pictures of bobcats. 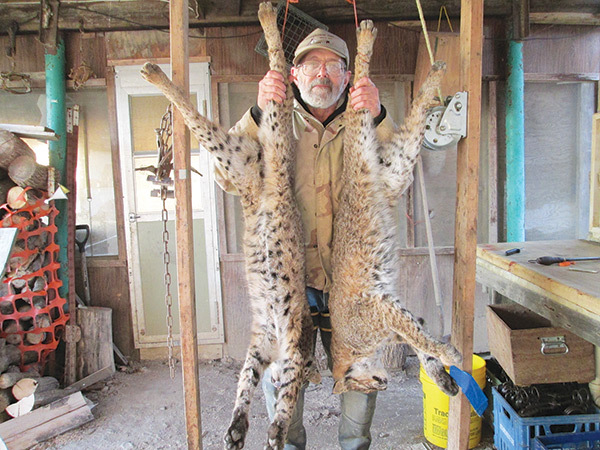 He always has wanted to see a bobcat captured “for real,” and even though he sets aside a day to go with me on the line each year, it hasn’t happened yet. I park the four-wheeler and climb up the wooded slope beside the gully. About three-fourths of the way to the top, I find a cat dropping. I am quite pleased with myself at this point and climb the rest of the way to the top. It appears a road once ran down the top of the ridge. It is mostly overgrown now, with a jumble of fallen trees blocking the way—a perfect place for a cat set, and I make one. I climb back down the hill and go on to my next location, an annual producer where a little shooting lane through the woods T-bones the grass lane. I make an improvised cubby set at the base of the hill near a cedar tree. I use an extra length of chain to fasten the trap to the tree. A couple of hundred yards farther along, the lane makes a 90-degree turn to the right, creating another intersection of sorts at the base of the hill. I usually put two sets here, a dirthole in the middle of the lane and a urine set at the inside corner of the bend. I’ve taken cats in just about equal numbers with the dirthole and the urine set, and I make one of each this time. I’ve never had much luck trapping cats along the logging road, although I see sign of them back there. However, I still make a set where the road Ts off. Such intersections are good places for cats. I find a rotten section of a little tree with a hollow in one end. I lay that down with the hollow pointing at the intersection and add a shot of cat urine to the root wad. Someone had dumped a lot of rock on the old road, and it is nearly impossible to dig a trap bed. But I pry out enough rock to make the needed depression. Then I place a few stones under the jaws and levers until the trap sits solid, once again reminded that there is no wrong way to bed or stabilize a trap. I put a coffee filter over the pan and cover the whole thing with peat moss. I add a few small stones for foot guides. I don’t even think about a stake here. Instead, I use a trap on a two-prong grapple. If I catch a critter, it will get away from the set and not mess things up. Most of my traps are on grapples, but I decide to fasten the trap at the dirthole with a cable stake. Remakes aren’t that hard to do at a dirthole. I connect with a cat at the cedar tree. Unfortunately, the cat climbs the tree with the trap and jumps out! That allows it to pull free, and I find the trap dangling empty in the tree. I remake the set, this time fastening the trap to a 10-foot pole that will act as a moveable anchor and hopefully keep the next cat out of the trees. I have taken to inserting pieces of flagging ribbon in the chains on drags, two pieces about 2 feet long. One I simply thread through the chain. The other, I tie to the chain. When an animal leaves the set, the loose ribbon comes out quickly and tells me which way the animal went. The second ribbon hopefully stays with the chain, or if it breaks off later, still helps me locate the animal or at least the direction in which it went. Along this stretch I also have caught a lot of coyotes, and this year is proving no exception. At a set back in the timber at the oxbow lake, I find the trap missing and start looking for the ribbon. I see a shred of ribbon back in the undergrowth. Then I see the coyote tangled in the brush. I catch another one there a few days later. Both were investigating bobcat urine on a stump. Right where I enter the property through the main gate, I notice a lot of coyote droppings on the road. I had never made sets there and really don’t like to make a set anywhere near a gate where prying eyes might look in and see the set or a catch. But this gate is always locked, and Scott is planning to go with me the following day. Maybe if I put a coyote set right here, I can catch a coyote for him. I know he’d be tickled with that. I keep the set low-key, just a chunk of wood about as big as a soup can, placed next to the road. Again, because of the road gravel, I have a heck of a time making a bed and stabilize the trap with stones, and again, the trap is on a grapple. Since I am targeting coyotes here, I cross the road and scrape up some ground duff under an old cedar tree. I sift this over top of the peat moss bedding to better camouflage the dirt pattern. The next day, I unlock the gate and drive in. Scott follows in his own vehicle. I don’t see anything in the vicinity of the set I had put in the night before and drive on by. If the set had caught a coyote, it likely would have been tangled up nearby, thrashing around. I park my truck and quickly unload the ATV. While Scott is busy unloading his own machine, I backtrack to the coyote set and find that the trap is, in fact, missing. But there is no commotion anywhere, and I am peering intently into the brush looking for any disturbance when Scott pulls up on his STV. I inch forward, scanning intently. I spot one of my blue ribbons. But I see no trap and no critter. Is the ribbon loose or still attached to the trap chain? I inch forward some more and see that the ribbon is attached to a trap chain. Did the critter pull out of the trap? All of a sudden, a bobcat explodes from the treetop where the drag still is tangled. It never ceases to amaze me how a cat can lay still and blend almost completely into the background. I dispatch this cat and remake the set, explaining to Scott that it actually wasn’t a cat set. The cat investigated coyote urine and got caught. It happens. We drive on down the logging road. I pick up a beaver at the lake, but the cat set which had caught two coyotes is empty this time. We come back to the truck and start down the other way, on the grass lane. There, by the cedar tree, a cat is struggling against the pole drag. By this time, Scott must be thinking I am quite a cat trapper, but I know it is just plain old dumb luck. We head on out to the river, where we pick up two more beavers from two castor mound sets, one on the bank of the river proper and one 100 yards up a tributary. It is turning into quite a haul, and Scott is one happy customer. A couple of days later, I catch a cat at the dirthole set. A couple days after that, I catch a cat on top of the ridge in the jumble of logs. I am about ready to close down the line, figuring I caught the majority of the beavers. With four cats in the shed, I probably have them thinned out, as well. I ride out to the intersection of the logging roads and find that trap missing. The two coyotes I had caught in the set before had headed straight for the bushes, where they had tangled up and made a terrible mess. In fact, I had quite a time picking up all of the pieces of shredded blue ribbon where the coyotes had chewed it up. But I don’t see any chewed ribbon this time. I consider the possibility of trap thievery, but that shouldn’t happen behind locked gates. I launch into my standard search pattern, circling the set at increasing distances to see if I can pick up any sign. I can’t, but I keep peering into the brush for movement where a critter might be tangled. I am quite a ways from the set, still expanding the search, when I come upon a patch of tall grass next to the road. I am looking to see if a critter might be tangled in the trees beyond when a cat runs out of the grass, pulling my drag behind. It tangles us as soon as it hits the brush. I have no idea why that cat lay in that grass waiting for me, but it makes five cats trapped in one small area; six if you count the one that jumped out of a tree to get away.